Google Web Designer - What is it for and What’s the future? 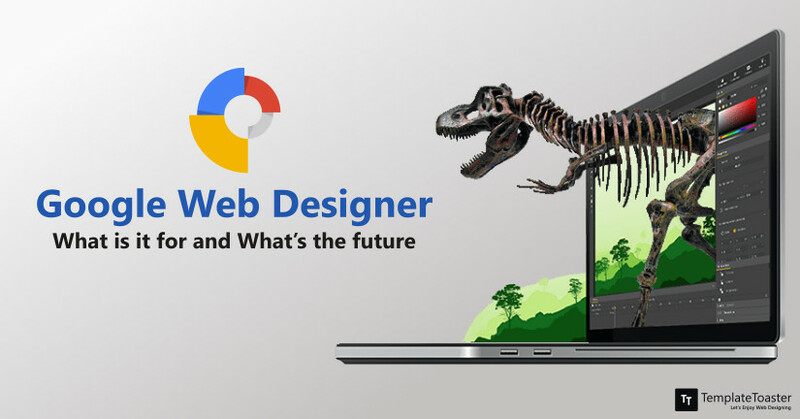 Google Web Designer – What is it for and What’s the future? Google – Certainly a powerful brand that doesn’t require any introduction. And if you are one of these users who believe Google Web Designer is a potential web designer tool, then you need to read this. Undoubtedly, Google Web Designer is a good design tool to work visually without messing with the code. But, can you really depend on this tool to design a website? Can it produce a full web application? If you have the same question, you should read it till the end to know more about this tool. Here at Templatetoaster web design software, I will try to analyze all possible aspects of Google Web Designer. And further will try to figure out what its future is. First, have a look at what is it and how does it work? Google Web Designer tool is a program for creating interactive HTML5 websites and ad banners. It is a standalone software for Windows, Mac, and Linux. It is a WYSIWYG (What You See Is What You Get) editor to lets you create interactive HTML5 based designs. GWD (Google Web Designer) can be viewed as a simple tool to develop cross-screen compatible content. This GUI based Google tool is simple to use even for beginners while enabling the experienced developers to dig deeper. The automation features of GWD gives you the freedom to design without worrying about displays as the GWD designs and motion graphics can run on any device. Let’s take a look at the features of Google Web Designer that makes it perfect for creating HTML5 designs and animation ads. Google released Google Web Designer Software for the first time in 2013. It has been continuously evolving since then. The statistics show that over 7679 websites have used GWD and 2,175 live websites are still using it with an addition of 5,504 that used it previously. So, let’s briefly talk about the features that made Google Web Designer a popular choice among users. The fluid layout allows users to use percentages when setting top, left, width and height styles. When the size and position of elements are set in percentage, they can shrink and grow with the container while keeping the overall structure unchanged. This was the major issue with the fixed layout that to make even a small change in the container, it required a user to manually reposition all the elements. And with the introduction of the fluid layout, users can easily maintain the layout while resizing the container. Google Web Designer provides a 3D Stage Rotate tool to examine the effect of an element on every side. You can simply click and drag the object to rotate it. So Google Web Designer expect a full-3D authoring environment. Google Web Designer Software has a fantastic feature to convert a page into HTML file. You can incorporate any Google Drive page into Google Web Designer for automatic conversion to the HTML. DoubleClick Studios gives cross-screen facilities. So, you can quickly create ads for both mobile and desktop screens. Google Web Designer is integrated with the DoubleClick Studio workflow that enables you to add image galleries, videos, maps, and other interactive features to your design. Google Web Designer associates the ad with the appropriate account, advertiser, and campaign. Once your design is ready, you can publish it straight into the studios. Google Drive is majorly seen as a backup or a platform to share documents. But Google Web Designer utilizes it in a highly innovative manner to publish the documents. This feature facilitates a preview of your creation on any browser a desktop or a mobile. This feature makes GWD unique amongst the other available editors. Google Web Designer tool provides a set of built-in components. And the “Build Your Own Component” (BYOC) feature support the newly build components and enhance the existing ones. These custom components will be enclosed in a ZIP file. Once they are imported to Google Web Designer, they become the native components. Google Web Designer Software includes many animation options like animation scrubbing, timeline events, auto keyframing with animation modes. It has two animation modes: Quick and Advanced. In Quick Animation Mode, you can create an animation scene by scene by adding a new view of the entire page. You can change the elements, modify the transition timelines, easing and much more. But in Advanced Mode, you have better command over individual frames. It will display the layers to modify each element from a stack of elements. Google Web Designer tool provides you a rich color panel to choose the default colors and you can make the new custom colors or complex gradients. You can save these as a custom swatch. Google Web Designer groups allow you to design reusable objects. Any change you do to the group will reflect in all its instances. No need of copy-paste. If there are no instances of a group, it will save as a companion file. The overall file size will not be affected by it. Groups can encapsulate animations and can be used for generating dynamic galleries. Google Web Designer has many revamped web components like Canvas shapes, 360 Gallery, Carousel Gallery, Swipeable Gallery, iFrame, Map, Tap Area, Video, and YouTube etc. to offer. It further consists of the Gesture Components to facilitate use touch and mouse tracking, taps, clicks and other touch gestures. It gives you a TaptoCall feature to initiate a phone call to your specified contact number. I am sure that till now you have become familiar with the key features of the Google Web Designer software. Let’s now further explore its components. It is a transparent element that can be placed at any part of the screen to trigger an action with a touch or mouse-click. It is applied to capture user interactions with your HTML content or with Ad. This image button component is used to form a button with three visual states. Including an unpressed image, a pressed image, and a hover image. It is another transparent element to initiate a call or SMS to a specified contact number. Google Web Designer enables you to set up a simple gallery to freely move backward or forward through images or groups. Google Web Designer allows you to add a positionable navigation pane to a Swipeable Gallery. A Carousel gallery component aids you to build a swipeable carousel-like gallery for multiple images to give a 3D look. It shows an object on all sides, swiping back and forth to turn the object around. Google Web Designer tool enables you to place a custom video, YouTube video, audio or map in your ad. You can include a Google Street View imagery to your project. You can mention the location, panning, and rotation for better user- interaction. You can position it over any part of the screen to create an event reminder that users can add to their calendars. Google Web Designer permits you to load external URL elements in your project through iFrame. This component is used in sprite-style animations and to place several images within one sprite sheet. Now is the time to find out the Google Web Designer Templates. Google Web Designer software has a number of rich media templates to offer you. It lets you create desired fully functional ads using these templates. You can easily customize any of these templates as per your specifications. Visit the official web page of the Google Web Designer to view and download any of the Google Web Designer Templates depending on their features, size, format etc. 30 new banner templates have been added in the recent times with support for both AdWords and DoubleClick. It now becomes easy to train yourself to design ads with Google Web Designer Certification and take nourish your skills. If your are one of those users who want to know that “Is the Google Web Designer free?” YES! It is completely free to use. Simple download the Google Web Designer and use it. Once you have downloaded the software, look for setup file of Google Web Designer offline installer and install it. If you are wondering “How to use Google Web Designer?” Well, there are various tutorials available which thoroughly explain how to create a website using Google Web Designer, and how to design the ad banners. There are some really good Google Web Designer tutorials for beginners on the official web page of Google Web Designer which you can refer for clear understanding. It also includes many other Google Web Designer examples, for instance, The Jungle Book, Minority Report, Nuovo SUV Peugeot 2008 etc. You can go through the support articles for a step-by-step guide to learn how to use Google Web Designer to make a website. Google Web Designer has a clear and interactive interface which can successfully create animations. This is also useful for prototyping. In fact, it is responsible for creating CSS3 animations on HTML5-based adverts. But too many control options in the panel makes it look heavier. Despite all its benefits, it is unable to justify its name. It can not open the HTML files created by other web design tools. It lacks in text content creation features. To obtain the desired results with Google Web Designer, it is mandatory to have knowledge about the source code. If someone is already familiar with CSS3 concepts, then what is the purpose of using Google Web Designer? Even though it’s free; but available in beta version only. In a nutshell, it’s worth creating popup ads, sidebars but certainly not the full-fledged websites. So, you can consider it as Google Ad designer. And this definitely calls for a more advanced and improved version of Google Web Designer. It would be fair to state that Google Web Designer creates both dynamic and responsive advertisements. Google Web Designer lets you create animations, 2D or 3D designs according to your needs. Perhaps it is an excellent choice and a peerless free tool for ad creation but is not as skilled as a web designer. If you want to design a full-fledged website, you need a to check list of the best web design softwares like TemplateToaster. TemplateToaster is an impressive web design software that gives you the full control over your design. It incorporates all the advanced web designing options beautifully assembled in a user-friendly environment. A well-structured drag and drop interface will solve all your problems with a single mouse- click. No coding is required to create your own website. You can add header video backgrounds, slideshows, stock photos and anything you can think of. You can have dazzling designs with easy menu builders to design any type of menu like hamburger, magazine, horizontal, vertical etc. It provides you hundreds of color schemes and fonts. You can get benefit from in-built logo & image gallery and icon library. It supports all the major CMSs and all your designs will be cross-browser compatible. If you wish to have a great web designing experience you can trust TemplateToaster website builder. Google Web Designer perform better as an ad designer. It carries some options for web designing, though, which are not suitable for quality web designs. Google Web Designer is suitable for only those users who have little knowledge of HTML & CSS. Even after 5 years, Google Web Designer is still available in beta version only. But in my opinion, before we completely abandon this software, we should wait for some time as this product comes directly from the house of Google itself. So, we can expect a good application after addition of some new design features and bug fixing. So far, this is a great advertising designer and we hope Google to introduce a quality web designer in the near future!